Great interview, but still us fans need…MORE EMMA!!! What an amazing interview. Thanks for doing this! Thanks a lot, that absolutely made my day! Stuck at work behind my desk and came across this site. Made my day listening to Desire Lines. All I have to do is rmemeber the Luna Park ’94 gigs to rememeber what a raw energy with polished talent there was in the band named Lush. I think Emma is quite underrated as an axe-person, and as a songwriter too. Unfortunately, I agree with Miki saying that Sing Sing was nowhere as good as Lush. Now this band is over as well, it’s time for you, Emma, to show us how arse-kicking you can be when performing with Miki and Phil. Lush has, unfortunately, been ove for some 11 years. So all Lush fans should probably stop calling for a reunion. The last thing that band needs is to join the oldies circuit! However, Emma was such a great and inventive writer and arranger that she really should keep at it. The world can never have too much great art! It was closer to happening than people realise. I’m an Anglo-American film producer/writer/actor and I can’t even begin to elaborate on how LUSH affected me artistically, aesthetically and in the realm of pure joy and aural appreciation! 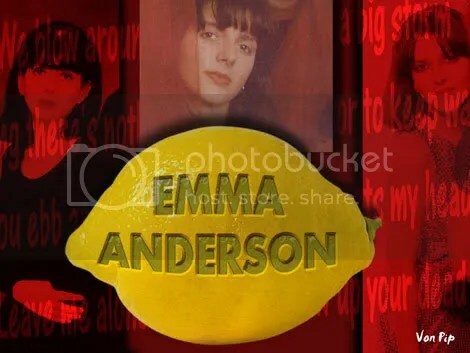 I have no idea how one would get hold of Emma, but if I were ever to find that she was interested in composing for the screen or writing soundtrack material, I would offer her the gig in a minute! I still have the De-Luxe EP (was it an EP or 10″, can’t remember). Thanks for the interview folks. Great stuff and thanks for the music Lush.